I enjoy learning about history, and this book was all about the history of the residential schools. It also included the Calls to Action from The Truth and Reconciliation Commission of Canada. I had never read through the Calls before, but I found them to be quite extensive. 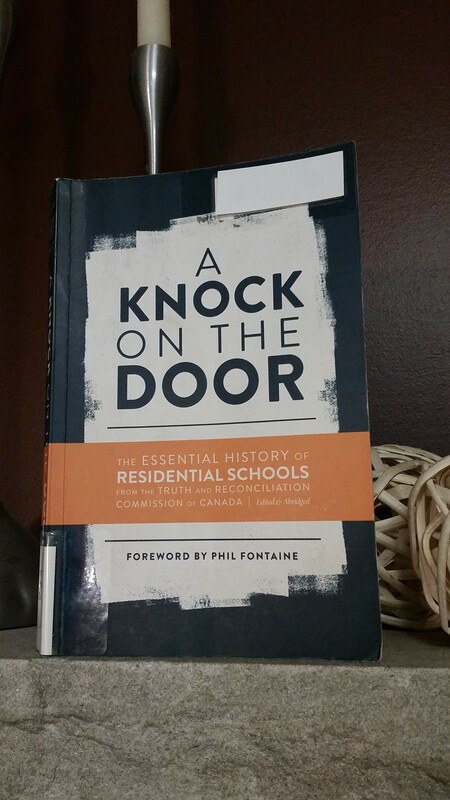 This book would be great for anyone interested in knowing more about the residential schools and also those who are wanting to work towards reconciliation. ” ‘It can start with a knock on the door one morning. It is the local Indian agent, or the parish priest, or, perhaps, a Mounted Police officer…The officials have arrived and the children must go.” So began the school experience of many Indigenous children in Canada for more than a hundred years, and so begins the history of residential schools prepared by the Truth and Reconciliation Commission of Canada (TRC). Between 2008 and 2015, the TRC provided opportunities for individuals, families, and communities to share their experiences of residential schools and released several reports based on 7000 Survivor statements and 5 million documents from government, churches, and schools, as well as a solid grounding in secondary sources.” (Back cover of book). *My progress for the Canadian Book Challenge is 8/13! !